In our recently published work, we studied the impact of the NZ Government preventing new retail outlets from selling tobacco from 2020, while allowing existing retail outlets to continue selling it until they closed or relocated. The estimated outcome would be a 50% decrease in the total number of tobacco retail outlets by 2032. This blog puts these results into the context of tobacco control options for NZ. Across the globe we’re seeing a stream of new nicotine products being brought onto the market and governments are faced with the daunting task of regulating them. Should they be allowed for sale, and if so, which types of retailers should be permitted to sell them and under what conditions? These are crucial questions to ask in relation to a product range about which the long-term health effects are still largely unknown. Yet the commotion about new nicotine products might be diverting attention away from combustible tobacco, an irreconcilably lethal form of nicotine delivery, the extraordinary harms of which have been well established for decades. Why is it that combustible tobacco products, one of the leading cause of preventable death worldwide, are allowed to occupy an extraordinarily wide range of everyday retail outlets throughout communities across the globe? And how should countries pursuing a smokefree goal, such as NZ, address this situation? Tobacco’s wide availability is a major public health problem. Easier access to outlets selling tobacco is associated with higher youth smoking, increased smoking among established smokers, and lower odds of quitting. Residents of the most socially deprived neighbourhoods are typically exposed to much larger numbers of tobacco outlets compared to more affluent people, meaning tobacco availability is contributing to health inequalities. A 2015 study by ASPIRE 2025 researchers found politicians and public servants believed reducing tobacco availability was important, yet not necessarily feasible. They feared there would be too much opposition from the retail sector, and thought the mechanism for reducing tobacco outlets was unclear. Yet a number of jurisdictions have begun to successfully address the problem of tobacco retail ubiquity, and Californian (CA) policies provide the most promising precedents. In Huntington Park (CA) for example, a law introduced in 2011 means any new retailers wanting to open an outlet in a residential area, or close to a school, will not be permitted to sell tobacco. This policy doesn’t affect existing tobacco retailers, meaning those retailers can continue selling tobacco as long as they stay in business. Our just published research looked at what would happen if NZ’s Government took a similar approach to Huntington Park. We came up with a hypothetical policy that could help reduce the number of shops that sold tobacco here. The policy was this: as of 2020, retailers wanting to open up a new retail outlet would not be allowed to sell tobacco at that outlet; existing retailers could continue selling tobacco at existing outlets until they closed their outlet or moved it to a different location. After closing an outlet or relocating, they could no longer sell tobacco from that particular location. We obtained Statistics NZ data on the number of tobacco outlets between 2006 and 2016 (supermarkets, convenience stores, service stations and liquor stores only), and the rate at which these stores naturally closed or relocated. We looked at what would happen to the number of tobacco outlets over time, if the policy we just described was implemented. We found that if the government prevented new retail outlets from selling tobacco from 2020, while allowing existing retail outlets to continue selling it until they closed or relocated, the total number of outlets allowed to sell tobacco in NZ could decrease by around 50% by 2032. Figure 1. Projected decreases in the number of outlets permitted to sell tobacco, by mean, highest-rate and lowest-rate business closure scenarios. 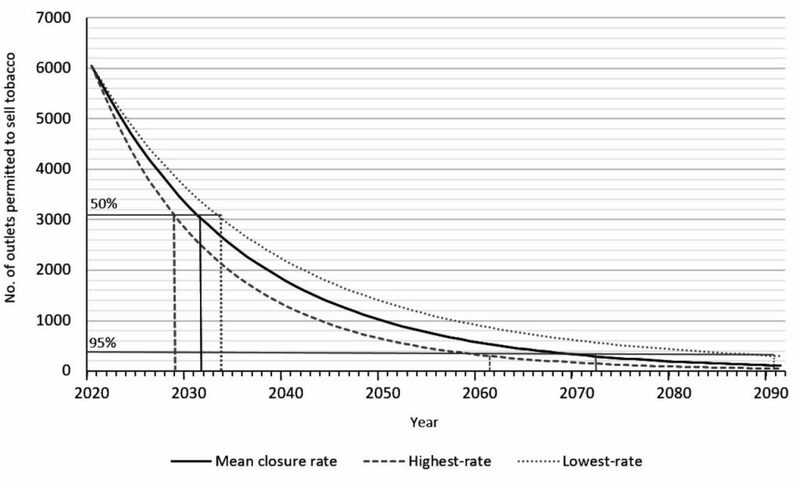 Note: the horizontal lines correspond to a 50% and a 95% reduction in tobacco outlet density; the drop-down lines represent the year(s) in which those reductions would be achieved, based on the highest rate, mean and lowest rate closure estimates. You might argue this reduction isn’t fast enough, especially for a country that’s supposed to be smokefree by 2025 (our estimates suggest the policy could result in roughly 27% fewer outlets selling tobacco by 2025.) Many in NZ would strongly agree with this argument. A 2017 consultation, led by ASPIRE 2025 researchers and Hāpai Te Hauora, involved Māori and Pacific health experts, community leaders and smokefree experts and practitioners discussing how to achieve the 2025 goal. One recommendation from this exercise was requiring all existing retailers to transition out of selling tobacco from 2022, and allowing only a small number of specialist tobacco outlets per district. Other NZ research has suggested that tobacco retail outlet reduction will result in health gains, especially for Māori, as well as large cost-savings to health services (see research by the BODE3 Team by Pearson et al and van der Deen et al). Outlet reduction is no silver bullet to achieving the 2025 goal – far from it – but it is an important component of a comprehensive smokefree strategy. Perhaps the key point about our latest research is we’ve identified a ‘last resort’ policy option – a way the Government could reduce tobacco availability if, for whatever reason, a faster approach is deemed impossible. The option we’ve examined is likely to be both politically feasible and effective in reducing tobacco availability (albeit in a relatively slow way). It doesn’t “ban” existing retailers from selling tobacco, a concern that risk-averse politicians may have. Existing retailers wouldn’t be disadvantaged. Instead, they would have time to prepare and adapt to becoming smokefree, like the rest of NZ. The emphasis is on preventing future retailers selling tobacco and chipping away at an important goal that will reap benefits for future generations. Amidst the noise surrounding new nicotine products, let’s not forget the deadly product we know kills more than half its users. A product that must, and can, be taken out of our communities as we move towards becoming smokefree. Dr Lindsay Robertson is at the University of Bath, UK (formerly Cancer Society Social and Behavioural Research Unit, University of Otago, Dunedin), email: l.a.robertson@bath.ac.uk. Funding for the new study described in this blog was provided by the New Zealand Cancer Society. I think it might be a mistake to use prior firm attrition rates to model attrition rates after this kind of change. After a while, the remaining tobacco-selling shops start having a bit of local monopoly power and start being able to charge more for cigarettes. Those rents would mean that if the current owners had had enough, somebody would be willing to pay more for that shop with the cigarette-licence at that location, so shops would wind up being stickier than they previously had been.